Home » Broadband » POTRAZ Event: Implementation of second national Internet Exchange Point in Zimbabwe. POTRAZ Event: Implementation of second national Internet Exchange Point in Zimbabwe. Remember the Internet Exchange Point (IXP) discussion from about a year ago? Well, looks like we may be making some headway now. We’re at a regulator (POTRAZ) organised event in Harare today where the implementation of the Exchange is being discussion. If you wondering what an Internet Exchange is, it’s a physical place (usually a room with machines and cable connections coming into it) that all internet providers would connect to in order to exchange internet traffic, essentially to ensure that the movement of internet traffic is as efficient as possible through their networks. For example, it ensures that when you access a locally hosted website, your request for that website travels the shortest distance possible to that website and content sent to you also travels the shortest distance possible, giving you a faster internet experience. 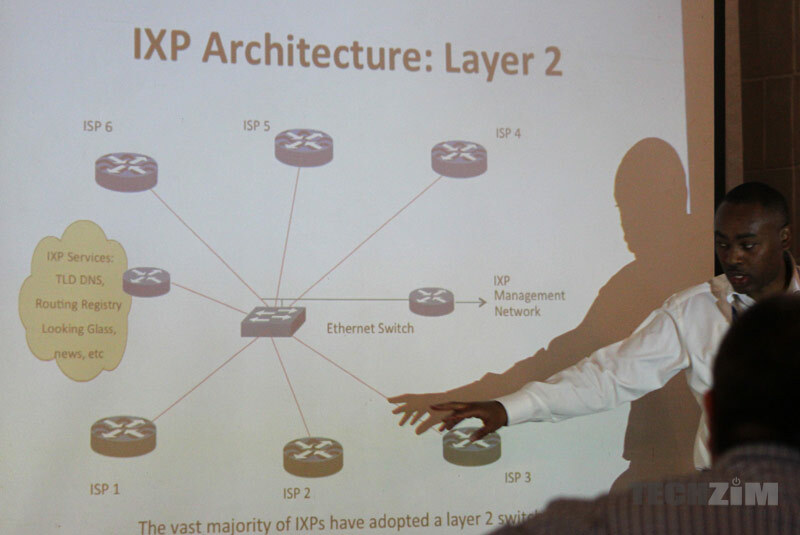 Zimbabwe already has an IXP which is managed by an association of ISPs called ZISPA (Zimbabwe Internet Services Providers Association). We’re not sure how well things are working there. In the past there have been issues of routing that would cause all kinds of problems for ISP customers. I remember customers of some ISP unable to access our website when it was hosted at YoAfrica some years back. There were also cases apparently when some ISPs would misconfigure routers resulting fellow IXP members having their international bandwidth inadvertently used by the offending ISP. Whatever the reasons, there has been talk of an additional IXP to complement the ZISPA one. This initiative is being pushed by the regulators, the Internet Society of Zimbabwe and ISPs. Hence the event to discuss the implementation of this new IXP being held today. We will update with infromation about the progress so far later. Finally, a Fintech event: Banking & Finance problems in Zimbabwe. What are the tech solutions? A second exchange would be good though. Local traffic is still terribly slow, ironically even when you are accessing sites hosted by your own ISP. Some of the latency issues won’t be alleviated by having a second exhange, there are many misconfigured network appliances that ISPs need to fix as well. I recall failing to access a website till we got the ISP to reconfigure one of it’s DNS servers under threat migrating to another ISP. That is very true, its not a single machine or router! What tend to happen is that its a single building, or buildings with close proximity connected by a fast self healing fibre network. Each ISP then put their routers with big guts enough to hold 500 000 plus BGP routes. They then interconnect amongst themselves, absorbing and routing traffic between each. Any misconfigured router from tone of them can take out others. Since we have about 4 big ISPs, it means we will have 4 big internet routers in there! my bad. initially wanted to go with a simplified explanation, then thot, the heck let me just say what it is, but somehow left the word machine in there. Its possible for it to be one huge machine. With SDN’s of course. SDN introduces latency, even if its minimal, it does. One things you do not want in ISP network is latency in any form. Hardware is always better in this case!! I think you’re wrong. I’m on a ZOL connection and I can trace a direct route to the few local ISP I tested just now. No Telone we peer locally with our global AS exchanging ALL AFRICAN traffic with them. can you qualify that with facts? You do not understand the IXP at all, do you? You’re all a bunch of nerds and you make me sick.